We all know that the end results of good orthodontic work, a stunning and straight-teethed smile, make braces well worth the effort. But while your braces are in place making your smile better, they can be frustrating and painful. Between your check-ups and tightenings, you may suffer from complications like tender, swollen, and even bleeding gums. But by understanding the causes of bleeding gums and braces, you can keep these symptoms to a minimum. At Cardiff Dental we give patients with braces the knowledge and tools to fight bleeding gums and maintain a healthier smile. What Causes Bleeding While Wearing Braces? Gum overgrowth. When you are unable to provide your teeth with proper cleaning and care, bacteria can accumulate, irritate the gum tissue, and cause gum overgrowth, leading to larger gum tissues. Gum overgrowth is typically found on the front of the teeth and can be on the side of the tongue in some instances. The swelling of the gum tissues gives your smile an unusual appearance and as the gums swell, the teeth become even more difficult to clean, leading to a vicious cycle. That’s why it is preferable to stop excessive gum growth in its early stages. New toothbrush can cause bleeding gums. Toothbrushes that are too firm can be hard on gums. You should always buy soft toothbrushes. Some people think that soft bristles won’t clean as well as firm but that’s not true. Just be sure to use the proper brushing technique and that you don’t push too hard. 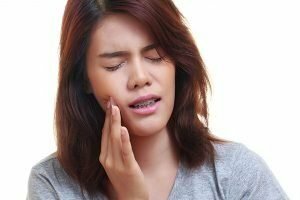 Pushing too hard can damage the gums especially if they’re sensitive to begin with. Braces wearers are quite susceptible to sensitivity and will find soft bristles less irritating to receding gums. Once you get your braces off, it is also a good idea to not brush too hard as you adjust to not wearing them anymore. Medications can cause dry mouth and bleeding gums. Some medications will make gums more sensitive, causing them to become inflamed which can lead to bleeding. Other medications cause blood thinning which can lead to gums bleeding as well. Check the side effects of the medications you are taking to see if bleeding is one of the side effects. Gum disease. If your gums are red, swollen and tender it could be a sign of gum disease. Gum disease can be caused by other factors but usually it’s due to poor oral hygiene. And oral hygiene is something braces wearers struggle with. Braces make it harder to clean along the gumline and between teeth. Good oral health practices are the surest way to keep gum disease away. This means brushing teeth twice a day for at least two minutes and flossing daily. Eat less sugar. Oral bacteria must eat—and they really like sugar. The more sugar they eat, the more they multiply—and the greater your risk of gum disease and bleeding. Eating fewer sugary foods and snacks and more dental-friendly ones helps restrict bacteria populations in your mouth. Brush well. Brushing with braces is more difficult, particularly in areas covered by braces. You need to be sure you brush all tooth and gum surfaces around your braces, including above and below the wire running through the brackets. A soft multi-tufted bristle brush is an excellent choice for cleaning those hard to reach places. Brushing around braces takes more time, but it’s a key part of effective plaque removal. You might consider an electric toothbrush, which is highly effective at cleaning teeth and braces. Floss regularly. Flossing is important for removing plaque from between teeth—but, unfortunately, braces make flossing extremely difficult. If using floss is difficult consider a floss threader or similar device that might be easier to maneuver. A water irrigator is much more effective than flossing. Water irrigators are a long-term investment in your dental health. 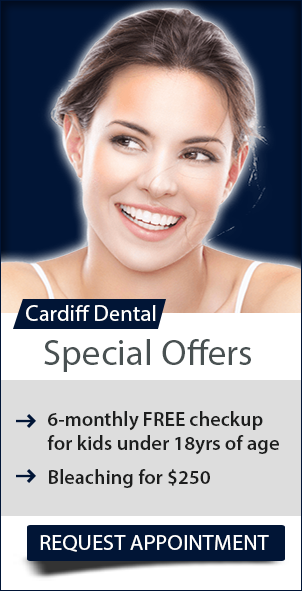 Visit Cardiff Dental regularly. You will see your orthodontist regularly for adjustments, but you also need to see us at least every six months. Besides dental cleaning we look for signs of disease and can prescribe preventive measures like antibacterial mouth rinses. If you would like more information on caring for teeth and gums while wearing braces, please contact us or schedule an appointment for a consultation. Call us on (02) 4954 6888 or request your appointment online today!